Looking for an unspoiled Greek island with some of the most beautiful beaches in Greece, an amazing hora, great food and few tourists? 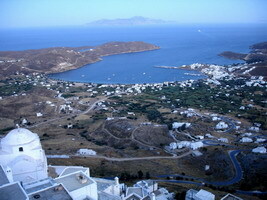 Serifos could be the place. Let me start off by saying that my friends from Sifnos, including Markos, the wise old sage, had truly tricked me. I realized this as soon as I got off the ferry and walked past the fish taverns and shops that lined Livadi, the harbor of Serifos. There was something innocent and unpretentious about it, and reminded me of the Greek Islands in the early seventies with tables and chairs of the fish tavernas right on the sand, a couple feet away from the sea. We dragged our bags to the Hotel Maistrali where Aegean Thesaurus had booked us. It was an Athens-style apartment building from the sixties or the seventies, the kind of place that Andrea normally says destroyed the traditional architecture of the Cyclades. But this was different and she loved it. Clean and decorated with historical photos and interesting art, the doors to the rooms reminded her of her old apartment in Patission in the sixties. 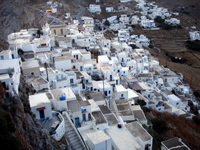 The view of the Chora (village)on the mountain was spectacular and the hotel was surrounded by kalamia (reeds) and farms. The owner, an Athenian named Babis Bobolos was a walking, talking guidebook for the island. 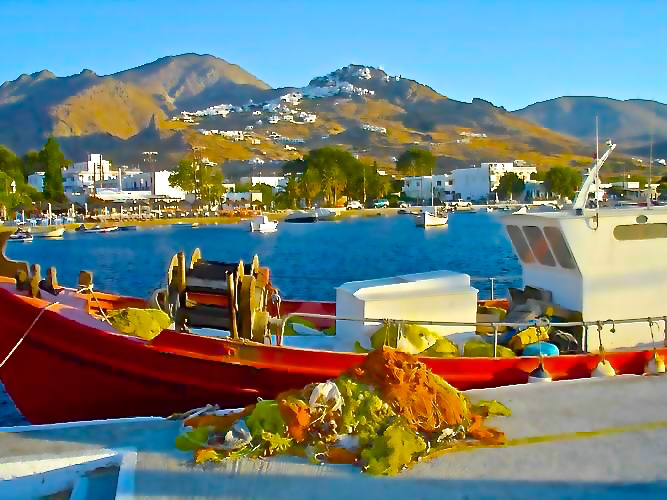 He had moved here from Athens 20 years ago and fallen in love, with his wife and Serifos. "You have to leave the port and see the beaches", he told us. 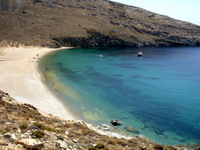 "You may think I am exaggerating but Serifos has beaches of the variety and quality of Milos, which as you know people say are the best in Greece."